You are most likely going to need a pair of ski goggles if you’re planning an exciting winter holiday. Different outdoor activities, such as skiing or snowboarding, will all require you to protect your eyes from the wind and the snow. All professional winter athletes wear a pair of snow goggles when they are competing. It’s not just an important security aspect, but they also look extremely good and will make you look like a professional skiing expert. In this article, we will review the Bolle Scarlett Modulator Goggles. It has plenty of compelling features that you can’t find on competitor products. But would it work for you or not? Bolle has a mission of making the best head protection gears out there for various sports enthusiasts. They are focused on creating sunglasses, winter goggles, and helmets that can be used for golf, cycling, water sports, and winter activities. Recently, they have also started making glasses and headgear designed to look fashionable and attractive. The Bolle Scarlett Modulator Goggles is one of their highest-selling products, and it has an outstanding fit for both casual people and professional athletes. 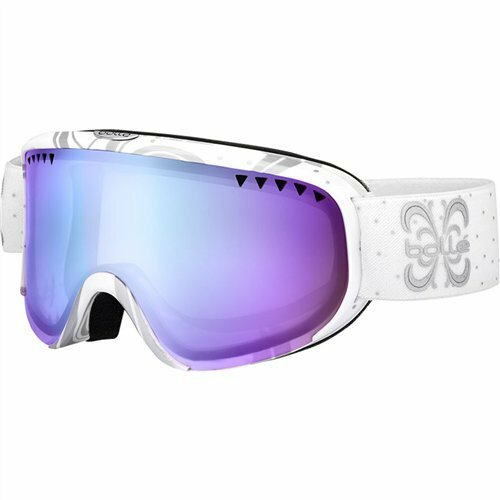 We would recommend these ski goggles to all those who are looking to get exceptional eye protection, combined with a fashionable looking design. It’s more suited for teens and adults than young children since the strap can be adjusted, allowing the glasses to fit their small heads. Do note though that the size of the visor will most likely be too big for kids. There are no additional goods that you will be provided upon purchasing the Bolle Scarlett Modulator Goggles. That said, all Bolle products, including these goggles, come with a two-year warranty that will cover any damage done to your glasses during shipping or while they are being used properly. The Bolle Scarlett Modulator Goggles has two lenses that create a dual-layer thermal barrier between the outside air and the inside of the goggles. Such as design helps prevent any condensation and remove the potential effects of the fog during various activities. Additionally, the inner lens has a protective layer that helps restrict any moisture generation and secures a clear field of view for all those who wear it. Further, the lenses are held together by a durable construction which features double-layer foam. This ergonomic design will make the goggles fit very comfortably on your face and ensure a pleasant experience during intense winter sports exercises. Inside of the lenses, there is a Flow-Tech venting system that enables a constant airflow inside of the goggles and between the lenses. This will allow your face to “breathe” and your vision to remain unobstructed. We recommend always wearing the ski goggles with a helmet since head protection is even more significant than eye protection. Thankfully, the silicon strap is highly elastic and will fit different helmet models, providing complete support. Finally, Bolle Scarlett Modulator Goggles offers a wide variety of looks to choose from. You can customize both the color pattern of the outside of the glasses and the shade of the lenses. Everything is available before final purchase, and you will be pleasantly surprised by the amount of customization freedom that you’re offered. The goggles are pretty simple to use and safe at all times. However, you should make sure not to make the strap uncomfortable for you by adjusting it incorrectly. Having it too loose might make the goggles fall off while you’re skiing, and having it too tight will stop the blood flow to your brain which is very dangerous. If you’re looking for a more affordable option, HUBO Sports Ski Goggles is a great choice. These goggles are far more affordable than the product we reviewed and offer decent utility for winter activities. Do note though that if you’re planning to get into professional winter sports, you might want an even more expensive alternative with additional features. In that case, you should take a look at the Zipline Podium Hybrid Goggles. These goggles are used by the official USA winter sports team and have exceptional value for their price. Both of these alternatives have various color schemes and sizes to choose from, and you will not be disappointed either way. Nonetheless, if your budget is not too tight, we recommend always going for the Zipline goggles, as they have outstanding quality. We have presented you with many important details about the Bolle Scarlett Modulator Goggles. These goggles are a great option for winter eye protection and are neither too expensive, nor too cheap. The silicon strap will ensure they fit correctly with different helmet models and the Flow-Tech venting system combined with the relaxing face foam will make your experience wearing them quite comfortable.